If you are staying with us at the Host Hotel there you can ride the FREE shuttle to and from the race venue. Pickup at the Hyatt starts at 5:30 am. 2 Buses will run every 10 minutes to the race. 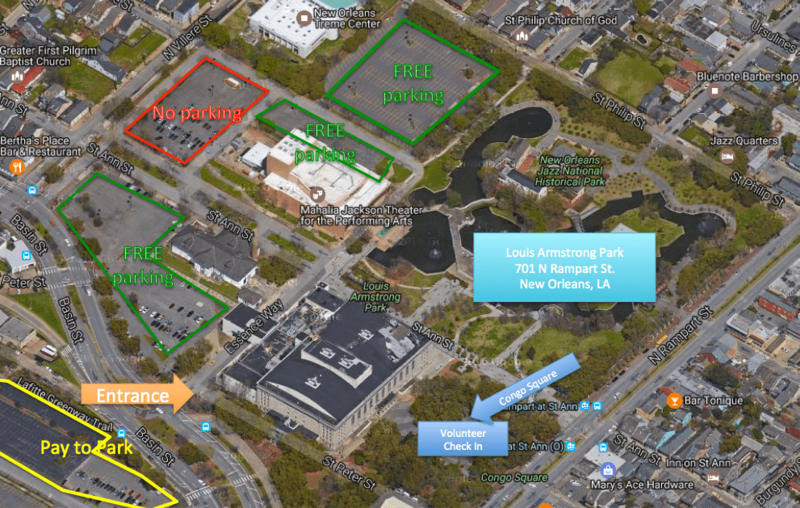 Pickup at Louis Armstrong Park (Race Venue) will continue throughout the morning. The last shuttle back will leave the venue at 11:45am. There are various parking garages and lots available throughout the city. The lots surrounding the park below in GREE are FREE. The RED lot is no parking. The Lot across the street is paid metered parking. Parking on most streets on Sunday’s are FREE where available.